Drama. The Dow Transportation Index is up +16% so far this year and the twelve of twenty of them that are in the Perpetual Bond™ since December are up +25% at the current prices – not including our profits on stop/loss selling or the results of a collar – please see almost any of the (B)(N)-Company posts for examples and Exhibit 1 and 2 below. There have been some changes but it doesn’t feel like six months of work. We sold FedEx Corporation and Landstar System Incorporated on a stop/loss in May, and haven’t bought them back because they appear to be trading at or below the price of risk, and we bought Con-Way Incorporated and Southwest Airlines Company in March because the ambient stock prices appeared to be at or above the price of risk, Risk Price (SF), and for no other reason. Please see Exhibit 2 below. If the “spin” is on – if and when it’s on – it cannot do us any harm. If we have to take profits on stop/loss or collars – OK, we will – but we’ll also know what to buy at the lower prices and we also know what not to buy at lower prices which is something that most investors have real problems with. 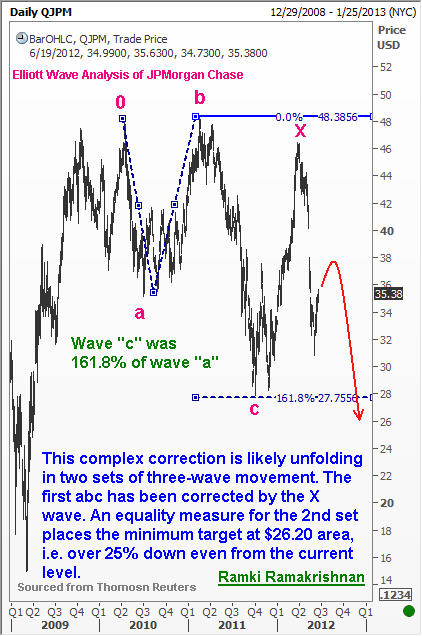 However, indecision is not a problem for investors who are slaves to the Elliott Wave Theory, or some such, or the Capital Assets Pricing Model (CAPM) and Modern Portfolio Theory (MPT). The “spin” will decide which line they’re on – alpha or beta – as their computer programs and tens of thousands like them, buy and sell a little bit, or a lot, of everything, until everyone is as average as possible, so to speak, as they were yesterday. We also use computer programs to help us, but average is not our goal and we only held about half of all the companies in the larger markets with capitalization of $2 billion or better, and that portfolio has hardly changed at all in six months, and produced +17% plus dividends so far this year and we keep everything that we get and we know how to keep on getting it. For more details, please our recent Post The Wall Street “Spin” For Sale. 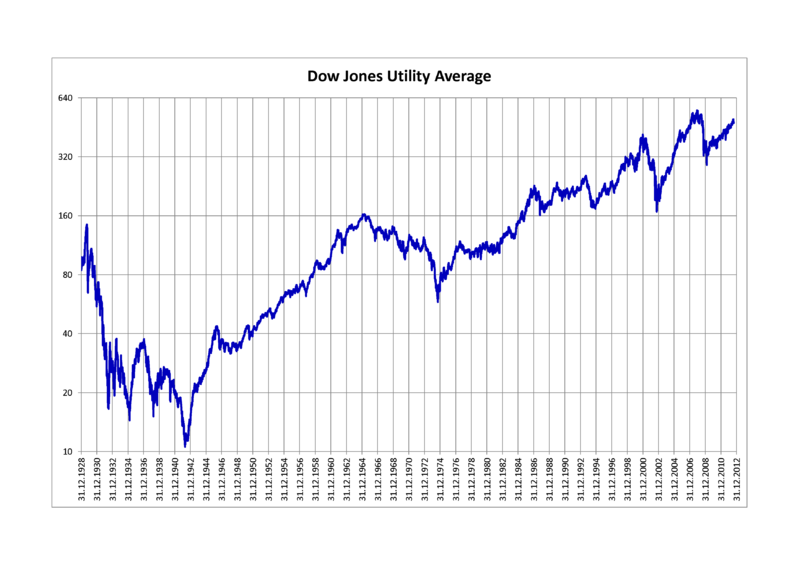 The Dow Utilities is a specialty portfolio and investors expect reliable high dividend rates, and high debt that is funded by the bond market which must also be paid. For example, the current fifteen companies in the Dow Jones Utility Average™ will pay $14 billion in dividends this year, to shareholders, and the current debt is $550 billion and up from $450 billion in 2010 (in round numbers) on which there will be interest payments of another $20 billion, to the bond holders. In addition, the market value of all fifteen companies is currently $325 billion, and up from $225 billion three years ago, and the dividend return is about 4% per year which is down from 5% two years ago, but that decrease can be partially explained by the increase in the stock prices. 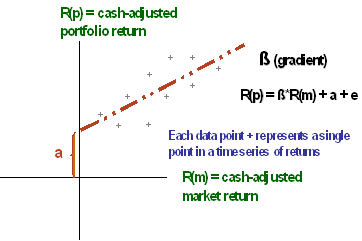 A rising stock price is bad for consumers because the companies will have to pay out even more money in dividends in order to maintain the dividend rate; if the rate falls, the companies might alienate the stock market and, therefore, have less bargaining power with the bond holders. However, not every electric company is an ATM machine, and of the fifteen, only eight have been in the Perpetual Bond™ since early 2009 (five years) and their return is +5% (plus dividends of another 4%) so far this year and only slightly above the index return of +4%. Please see Exhibit 4 and 5 below. And one might wonder how one producer of electricity should be different from another, and, surely, if anything could be average, then electricity companies seem like good candidates. Please see Exhibit 6 & 7 below. 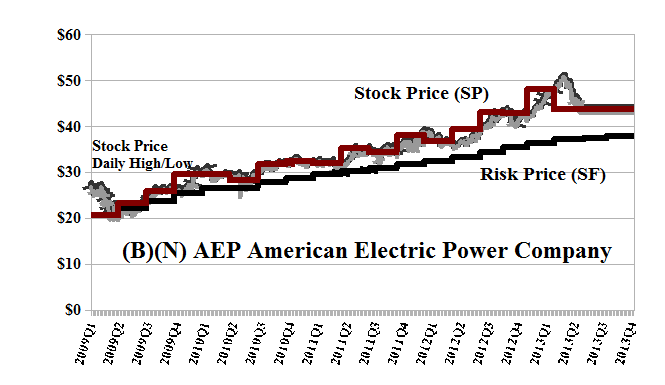 American Electric Power Company Incorporated is a public utility holding company, through its subsidiaries, provides electric service, consisting of generation, transmission and distribution, on an integrated basis to its retail customers. From the Company: American Electric Power Company Incorporated is a public utility holding company, and engages in the generation, transmission, and distribution of electric power to retail customers. The company generates electricity using coal and lignite, natural gas, nuclear energy, and hydroelectric energy. It also supplies and markets electric power at wholesale to other electric utility companies, municipalities, and other market participants. As of December 31, 2012, the company owned and leased approximately 37,300 megawatts of domestic generation capacity. In addition, it transports coal and dry bulk commodities primarily on the Ohio, Illinois, and lower Mississippi rivers. The company owns and leases approximately 2,600 barges, 45 towboats, and 25 harbor boats. It operates primarily in the states of Arkansas, Indiana, Kentucky, Louisiana, Michigan, Ohio, Oklahoma, Tennessee, Texas, Virginia, and West Virginia. American Electric Power Company Incorporated was founded in 1906, has 19,000 employees, and is headquartered in Columbus, Ohio. AES Corporation is a global power company. The Company acquires, develops, owns, and operates generation plants and distribution businesses in several countries. The Company sells electricity under long term contracts. 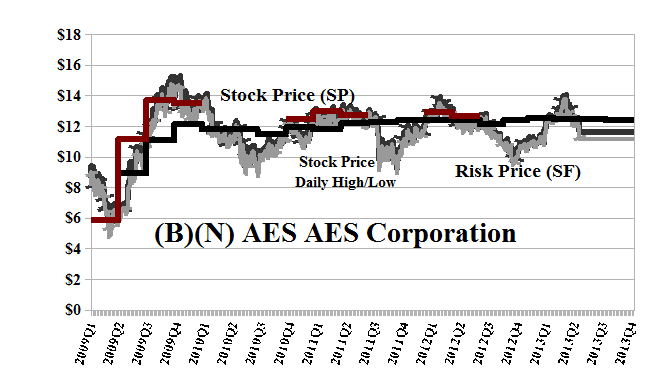 From the Company: The AES Corporation operates as a diversified power generation and utility company. It owns and/or operates power plants to generate and sell power to customers, such as utilities, industrial users, and other intermediaries. The company also owns and/or operates utilities to generate or purchase, distribute, transmit, and sell electricity to end-user customers in the residential, commercial, industrial, and governmental sectors; and generates and sells electricity to the wholesale market. Its portfolio includes a range of fuels, including coal, gas, fuel oil, water, wind, and solar. The AES Corporation owns and/or operates a generation portfolio of approximately 31,000 megawatts and the company has operations in the United States, Chile, Colombia, Argentina, Brazil, Mexico, Central America, the Caribbean, Europe, the Middle East, Africa, and Asia. The AES Corporation was founded in 1981, has 25,000 employees, and is headquartered in Arlington, Virginia.